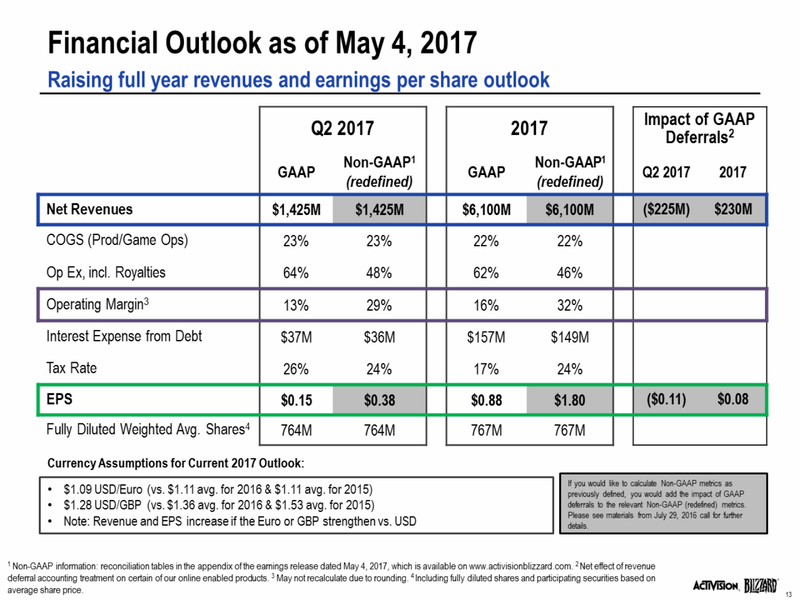 Activision Blizzard held a financial conference call yesterday (May 4) to report the latest earnings, and progress updates. There was not much info on upcoming content, but Blizzard is working on new content across all IPs. In concurrent registered player numbers, Hearthstone peaked with 70 million players, and Overwatch with 30 million players. 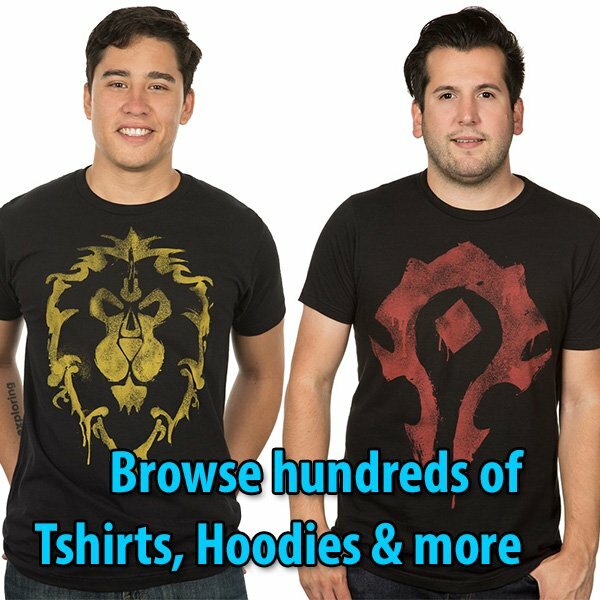 While no numbers will be revealed for World of Warcraft subscriptions, there was a performance compared to subscriptions during Warlords of Draenor. Revenue was increased by 50% due to the Overwatch shop (during the Lunar Festival and Uprising events), and Legion subs. Read the transcript below (heavily edited to focus on the Blizzard Entertainment aspect of the conference call). Thomas Tippl: Let’s start with audience reach, which was 431 million monthly active users this quarter. 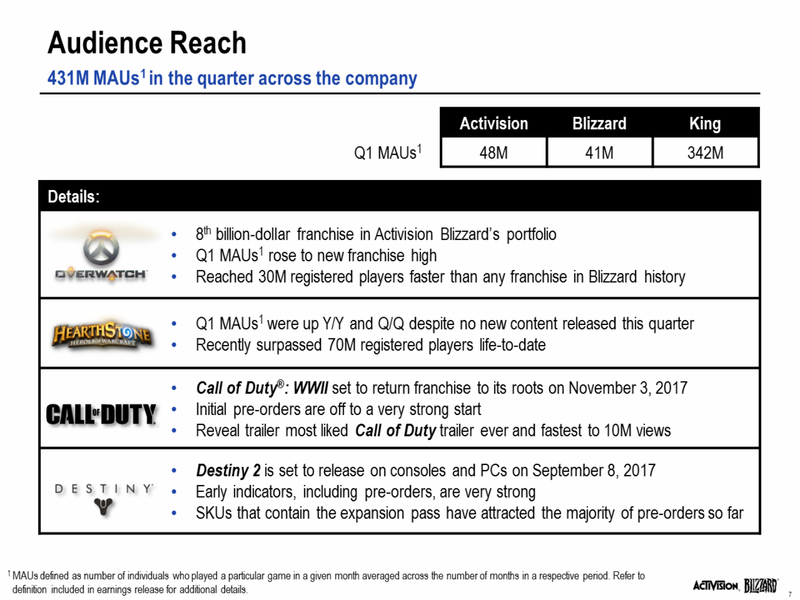 Blizzard had 41 million MAUs for the quarter, up 58% versus last year and relatively stable versus the prior quarter, despite no new full game releases. 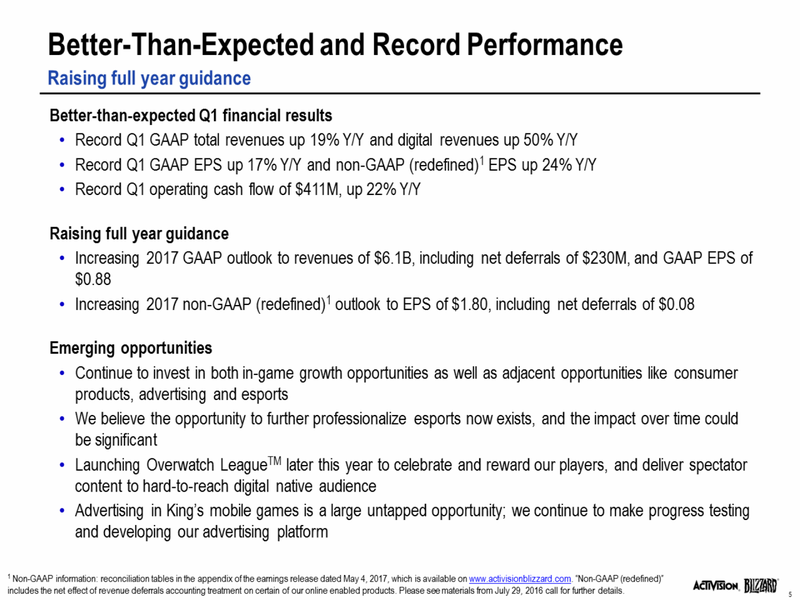 Blizzard’s fastest growing new IP ever (Overwatch), continues to grow from an MAU perspective, setting another high water mark this quarter. In less than a year since launch, Overwatch has 30 million registered players, and has become Activision’s eighth $1 billion franchise. Hearthstone continues to attract new players as well, reaching 70 million registered players life-to-date. 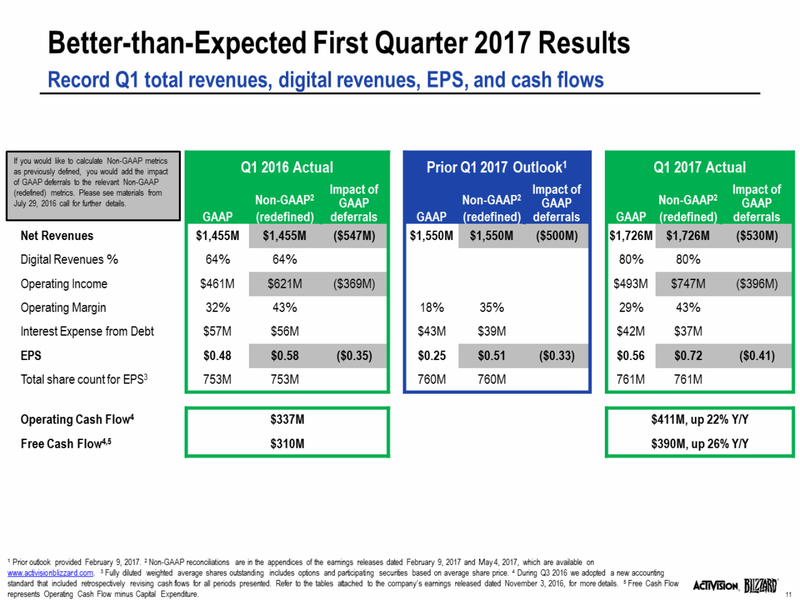 MAUs also grew year-over-year, and quarter-over-quarter despite no new content in Q1. Turning to our next strategic pillar, our compelling games, deep gameplay, and consistent follow-on content drove not only large communities, but also deep engagement with about 40-billion hours of gameplay over the past 12-months. Blizzard continues to see strong engagement from its players with time spent increasing by a double digit percentage year-over-year to a new Q1 record. 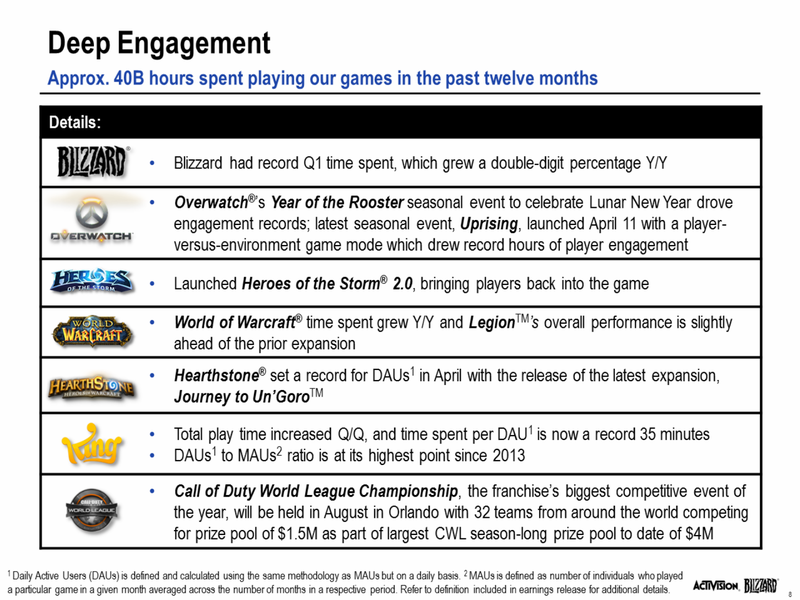 Overwatch, again, had strong engagement this quarter thanks in part to the Lunar New Year event, which like the 3 seasonal events before it, drove record engagement in the game. Overwatch’s latest seasonal event released on April 11th. This event named Uprising, included a player versus environment game mode, which drew record hours of player engagement demonstrating that Overwatch can appeal to players beyond player-versus-player competition. In April, Blizzard also launched Heroes of the Storm 2.0 with a more powerful progression system, reward pack loot chests, a new battleground, and more compelling heroes. All of which brought players back into the game. Blizzard’s strategy to release content, and feature updates more regularly in World of Warcraft has been paying off with time spent up year-over-year; and with overall performance ahead of the prior expansion. At the end of the quarter, Blizzard released the game’s second major patch since Legion came out, with more content to come later this year. To round out the terrific performance of Blizzard’s games, Hearthstone set a new all-time record in daily active users in April with the release of the new expansion: Journey to Un’goro. eSports is an important, and growing engagement driver for our community, and there were many highlights this quarter. Blizzard kicked off the StarCraft II World Championship Series, Hearthstone Championship Tour, and Heroes of the Storm Global Championship with major international events, along with the third Heroes of the Dorm college tournament in Las Vegas. In addition, the Overwatch APEX League completed its second season in Korea, and this year’s Overwatch World Cup was announced as part of a busy year of Overwatch eSports, as Blizzard gears up for the Overwatch League. Turning next to the third pillar of our strategy, providing opportunities for more player investment. 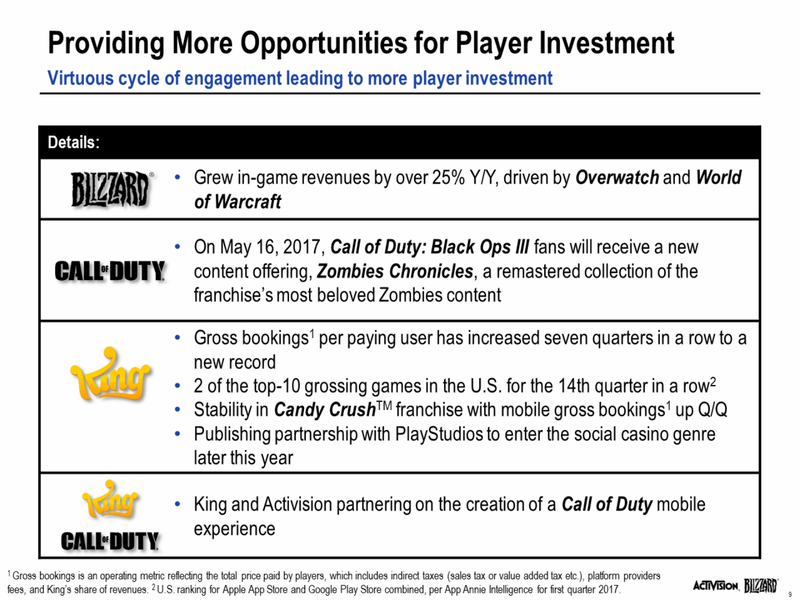 Blizzard saw an increase in total in-game purchases by almost 30% year-over-year, primarily driven by Overwatch and World of Warcraft, highlighting once again the virtuous cycle of engagement leading to more player investment. All of which starts with great new content. 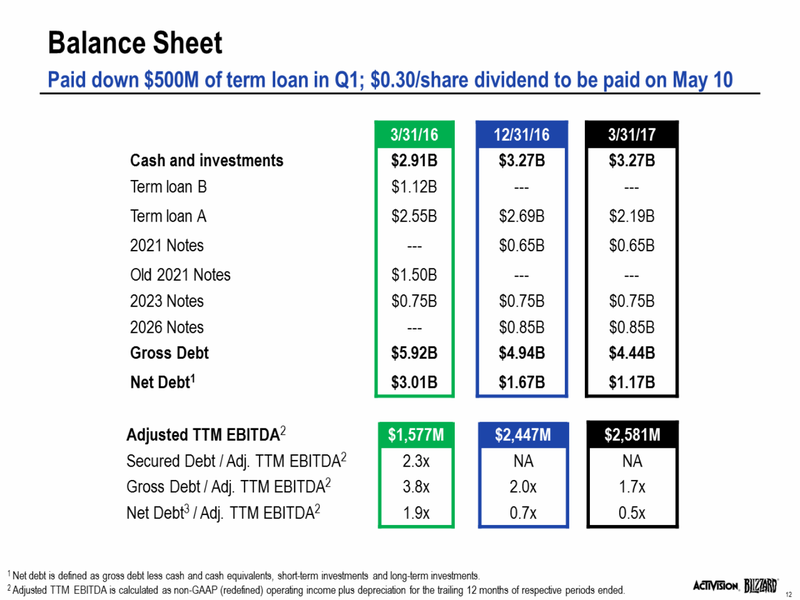 Dennis Durkin: Today, I will review our better than expected Q1 results, our outlook for Q2, and our raised outlook for the full year. Once again, we outperformed our guidance thanks to the strength of our global portfolio of owned IP, which delivered record Q1 revenues, digital revenues, earnings per share, and cash flow. 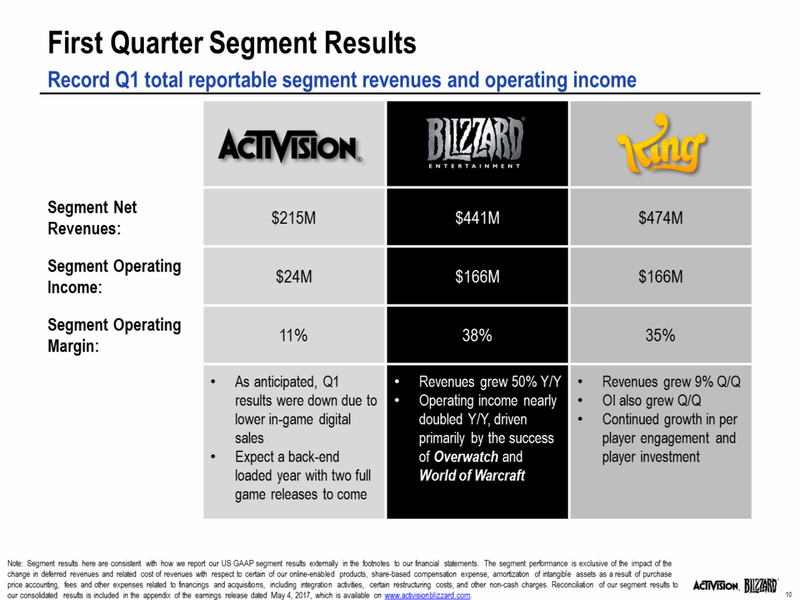 Blizzard’s revenue grew 50% year-over-year, while operating income nearly doubled driven primarily by the success of Overwatch as well as strong continued engagement in World of Warcraft. So the strong 2016 tailwinds for the Blizzard business continue into 2017. Our Q2 slate includes one of Blizzard’s busiest stretches of in-game content releases, including momentum from the March 28th World of Warcraft content update, a new Hearthstone expansion: Journey to Un’goro, the Overwatch: Uprising event; and the Heroes of the Storm 2.0 launch (with more content to come in the upcoming months). My question for Bobby or Mike around Overwatch, and you must be encouraged by the pace of growth with the user base. I am wondering just how large of a market opportunity you think there is for this game. How you plan on maintaining that pace of growth, and on a related note, if you could provide an update on the progress of the Overwatch League (including timing of league sales and kick off of the league). Morhaime: So right now we’re heading towards Overwatch’s launch anniversary later this month, and we’re incredibly happy with the community that’s developed around the game, how many people have already tried the game and how they’re staying with us nearly a year after the launch. Our first quarter MAUs were higher than we’ve seen all of last year, so that’s great. We’ve seen new players come into the game when we release new types of gameplay through our seasonal events. And we have a lot of opportunities to continue doing that. We are also pleased with how successful Overwatch has been globally across the Americas, Europe, and Asia; as well as our strong presence on both PC and Console, but we are tapping into the biggest genre in the world. So we think there is still a lot of room for growth across both regions and platforms. 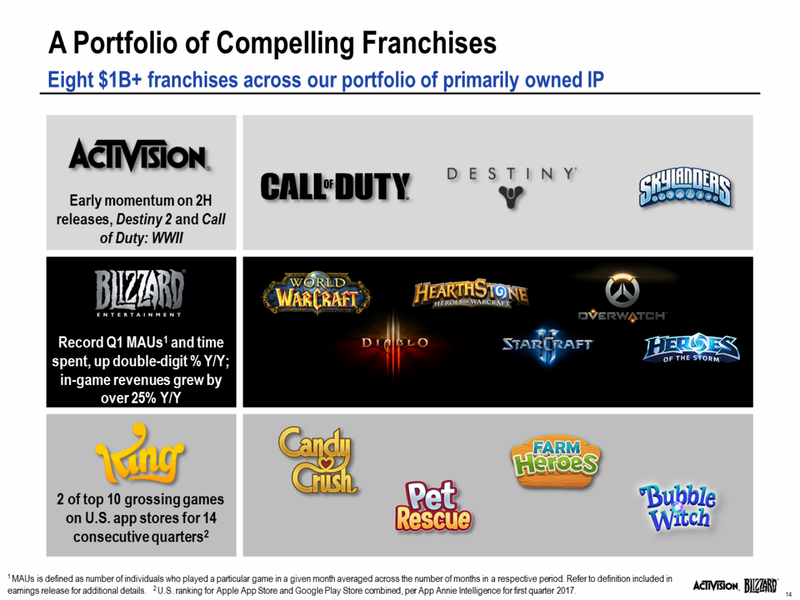 We think the Overwatch IP is incredibly strong, and has potential across a number of different mediums. Our out-of-game linear media (via comics, and animated shorts) has been really successful in fueling passion for the game’s lore; and we think there is an ongoing opportunity there as well. Our existing eSports community is really strong and it is growing. The Overwatch League is poised to accelerate that even more. So we are early in Overwatch’s story with many growth opportunities still ahead. As far as the Overwatch League timing, we are working to launch the league later this year. You will hear more about that in the coming months. So given Blizzard’s slate this year, with less full games being released, just curious how you think about the content to help keep the community engaged throughout the year and how you think about the monetization of that engagement? 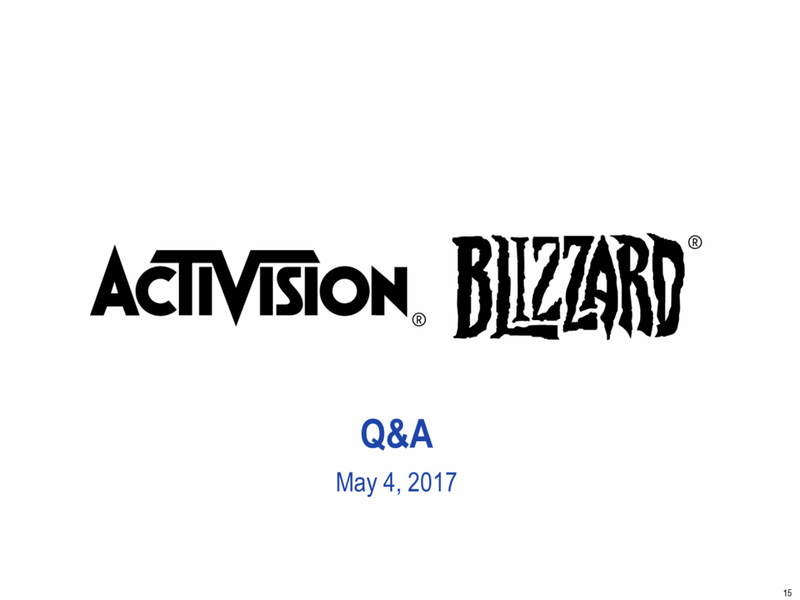 Morhaime: This year, for Blizzard represents a new type of pipeline. One that isn’t necessarily based on full-game launches, but instead on delivering new content updates for our games. 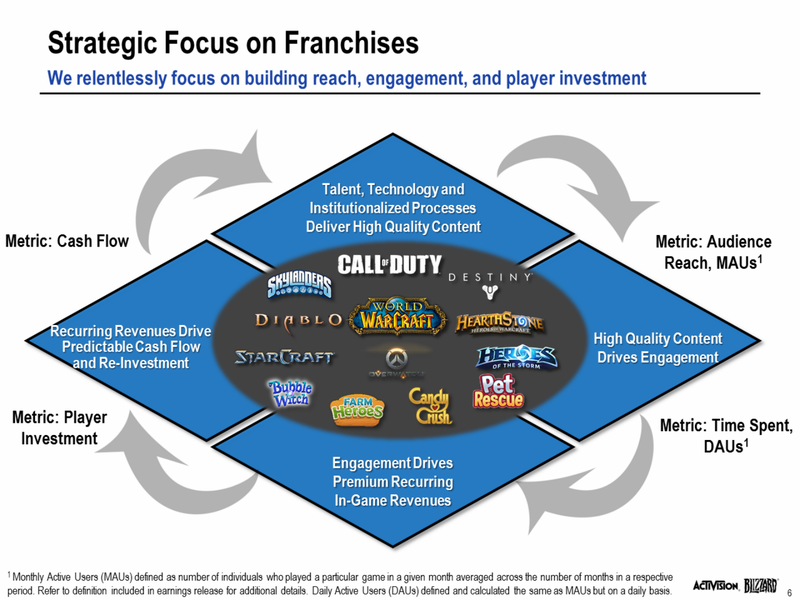 This quarter, we have meaningful new content for every franchise in our portfolio. In fact, a few weeks ago we set a new DAU record on the back of these new content updates. This reflects the evolution of our business from focusing primarily on full-game releases to also providing a consistent stream of content for our players. Even without any full game launches this year, we are continuing to add to the depths of our games to serve a very highly-engaged community, with more content across our portfolio than we ever before.